Check the hair condition, hair quality, and scalps etc. and select agents with hearing the customer’s requests. Basically remove the impurities and residues sticking to hairs without hurting scalps and make the hairs clean. Do pre-shampoo after checking the hair straightening history and the damage level of the hairs. In pre-treatment, there are 2 types: pre-treatment as treatment and that for easy perming. In the former type, we basically divide into PPT treatment and hair protection. In case of much moisture, dry lightly and do blocking in order to be able to apply agents easily. Apply PPT. Ceramiawith a trigger and irradiate ultrasound waves with SONIC STYLER PRO about 3 times. Apply the agent with a brush and comb the hairs a few times. After applyingPPT. Ceramia , spread the alpha cosmetic 1all over the hairs except 1cm from the hair roots. Press the hairs. Put the hairs between the hair iron lightly and pull the iron in order not to remove the agent from the hairs as a caution. The time depends on hairs, but please leave the hairs as themselves for 15 ~25 minutes. There is no alkali swelling since we use some neutral reductant. So, you cannot understand any result if you pull a hair like rubber. Pull out a hair bundle thinly and wipe off the agent. Then, apply some water with a sprayer and see the hair condition. Pull out a hair bundle thinly and apply some water to the hair root part with a sprayer. It is OK if you loosen the hair bundle to the root slowly and there is no kink. Fit a stopper into the shampoo ball and wash away from the nape. Then, wash away the agent with doing the change rinse procedure for the part front from the ear-to-ear part with the saved hot water. Dry the hairs by towel without plane rinse in order for the protein and moisturizing agent permeated to the hairs not to flow out. Completely dry with a dryer. Add some fever to the hairs, whose cysteine bonding are separated due to the reductant, with a straightening iron and combine the permeated protein with the real hair’s protein. 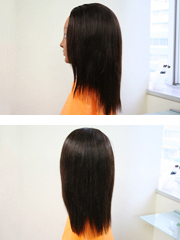 Put about 2cm hair bundle between the iron and pull it neatly. At the same time, pull out with a little tension and pull the iron by 160℃~180℃. With using a straightening iron and pressing to the middle part of the hairs by 160℃~180℃, pull the iron 7 or 8 times to extend the hairs. 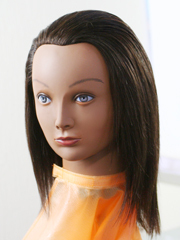 It is OK to pull through the damaged part of the hair ends once. Add the alpha cosmetic agent 2 in the condition where the hairs are wet, comb them, and dry them completely with a dryer. Since the alpha cosmetic agent 2 is hydrogen peroxide water, it is OK to leave for 5 minutes. Firmly wash away the agents on the parts such as scalps, face, and neck at the shampoo basin. After firmly washing away the agent, apply ＰＨ－ｃｏｎｔｒｏｌ－ＭＣ as post-treatment like rubbing onto the hairs, wash away by the change rinse procedure, and remove the moisture well with a towel. Firmly dry with a towel and dry with moving hairs at first in order for the hair roots to rise. After that, dry the hairs with a 2 way comb like combing them. Add a little styling agent to finish. Copyright(C) 2011-2019 A's style co.,Ltd. All Rights Reserved.